Color me frustrated. And, then, color me mortified that I’m about to make a deep, dark, fraught issue all about me. For much of the last 18 months, I’ve felt tugged toward work with refugees. This tug began when I read my first book about Syria 18 months ago, and it has grown in strength weekly. I spend a fair amount of time reading first-person narratives about escaping Syria, Afghanistan, Iran, North Korea, and other horrifyingly awful places around the globe. With each new story, I find myself growing ever more insistent that there must be a way I can contribute to a warmer welcome, an open heart, and a genuine desire to help heal the wounds so many in this world are facing today. So a couple of weeks ago, I bought some art created by refugees living in Greece, thanks to the incredible work of Love Without Borders, which brought an art exhibit to Chattanooga State Community College. My world politics students served as “docents” for the exhibit, and among our initiatives, we coordinated writing postcards to the artists and their families back in Greece. The money we spent on the artwork went directly to the artists to help them buy food and necessary supplies for their families. This injection of person-to-person contact (through an intermediary) was exactly what I didn’t need if the goal was to satiate my need to help. Instead, I now feel near obsessed with this need, and it’s just not happening. Monday, I went to a talk with a woman from Spain who volunteers in Athens several months a year with refugees living there. She played hostess to a group of Chatt State honors students who did a service-learning project there last May. I tried to beg my way into that service trip, but I was told I wasn’t allowed. When this woman, Mar, came to talk, she talked about the very real issue behind “voluntourism,” a phenomenon particularly problematic with refugee communities. She said that people who want to come and volunteer for a week or two often do more harm than good; they don’t have experience working with the needs of this particular community, and by the time they start to figure it out, they’re on a plane back home. Most NGOs ask for a commitment of at least two weeks before allowing volunteers to come to work with refugees. I heard someone say recently that the money spent on the travel to Europe would be better spent by giving it to NGOs to use where they need resources the most. The Melissa network in Athens provides a space for refugee women to spend time with other women. 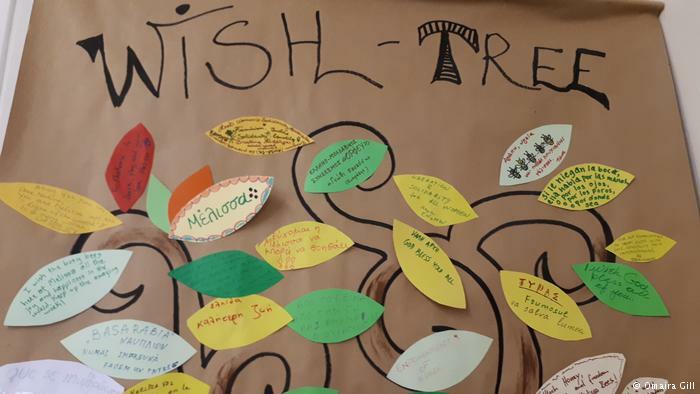 They have a wish tree where the refugees can express a wish. This is a picture of one such set of wishes. Thursday, I invited a representative from our local refugee resettlement agency to come talk to my students. Her message of hope and service was incredibly moving, but when we asked how we could be involved, we were told that the greatest need is for daytime transportation for refugees to get to a doctor’s appointment or other business-hours appointments. In other words, for those of us with jobs, there really aren’t opportunities to be involved. 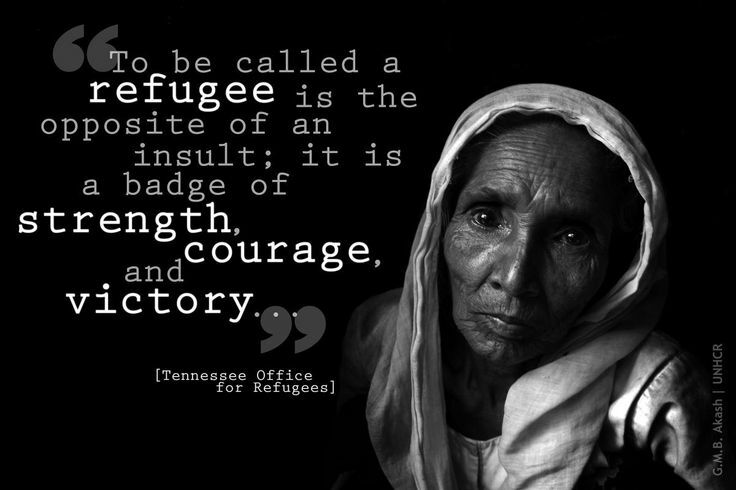 She told us that people who are resettled as refugees want to shed that label as soon as possible. They want to blend in. They want to be normal Americans. They want to have normal lives. They simply don’t need or want people to burst into their lives and demand to be their new best friends. Talk about a first-world problem! I know this sounds ridiculously self-indulgent to complain about. I have a recurring monthly donation to the UN’s High Commissioner on Refugees (UNHCR); I talk about refugee aid almost daily; I’m teaching the students in my classes about the need to be compassionate, understanding, and welcoming; I’m doing all that I can without actually interacting with refugees. And yet, it feels like I should be doing more, and I’m rather frustrated that I can’t seem to find a way to do so. If you haven’t, please explore the UNHCR’s web site (http://www.unhcr.org/). 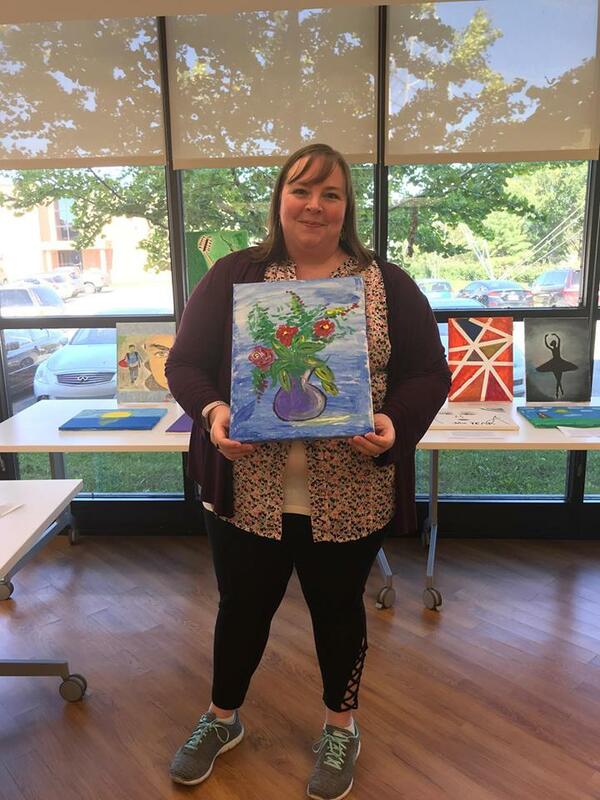 Please follow Art Without Borders on Facebook and help Kayra and her artists in any way that you can (monetary donations help purchase art supplies; purchasing artwork is an intensely emotional experience and wonderful). Please read books of bravery (such as A Hope More Powerful Than the Sea or City of Thorns or The Girl With Seven Names, to name just three of dozens that are worth your time). But most of all, please be an ambassador for those who have left home. As Mar said to us Monday, “no one leaves home unless home is the mouth of a shark” (a quote from a poem of the same name, by Warsan Shire). Read their stories wherever you can. Buy sponsorship gifts for Christmas for your relatives (you can do that here, for example, from the International Rescue Committee). Stay up-to-date on what’s happening (the IRC does a good job of that, too). Hold your families close, and keep your heart open.